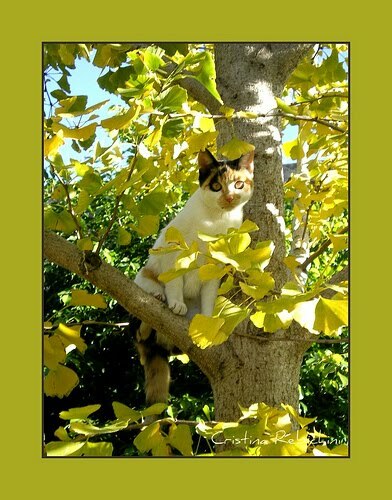 * New photo photospecial page: Germinated Ginkgo seeds + video. Photo by Cristina Rebichini on Flickr.com. 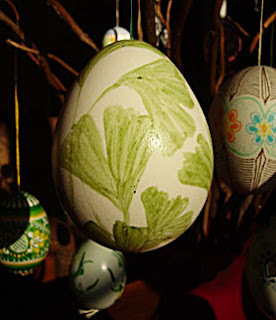 Easter egg painted with Ginkgo leaves. Happy Easter! Photo sent to me by Wieland Haak, thanks! * New picture on Fossils-page: Shunosaurus under a Ginkgo yimaensis, Middle Jurassic of China. * Added new video on my YouTube channel and on my Propagation-page: germinated Ginkgo seeds. 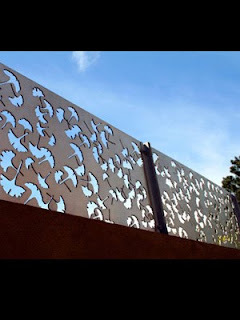 "Sheets of 1/4” aluminium were laser cut with designs referencing scattered leaves from a nearby Ginkgo tree. The fencing obscures the visibility from the neighboring residence while still letting light pass through and casting shadows that move along the deck. Aluminium awnings and fence were created for a residence and the steel, copper and bronze gates for a studio." This fence is shown by Lynn Susholtz , San Diego county, Ca. 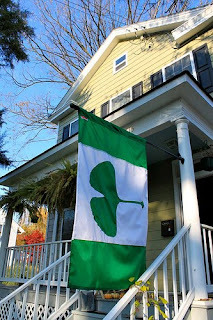 Flag with Ginkgo leaf on a house in Virginia, USA. Photo by tashamck on Flickr.com.